On Thursday September 2nd, I was sound asleep in my best friends apartment in Seoul. 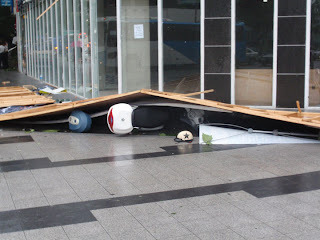 Little did I know that outside tree's were falling down, and entire signs and advertisements were falling off buildings! tried to walk to school in the morning. As soon as she walked outside she understood what the doorman's deal was. According to my friend Andrea, at 6:00 AM the winds were about 60mph and the metal pole of her new $35 posh Korean umbrella completely bent in half! The storm had died down by the time I had walked to work, but I was able to see the aftermath of the storm. 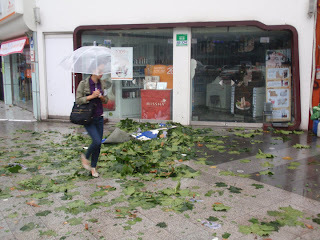 The streets were covered with leaves and debris that had flown around the city. Shopkeepers everywhere were sweeping the sidewalks outside of their companies and picked up trash for hours. Across the street from my company a sign fell off a building and crushed several scooters that were parked below. 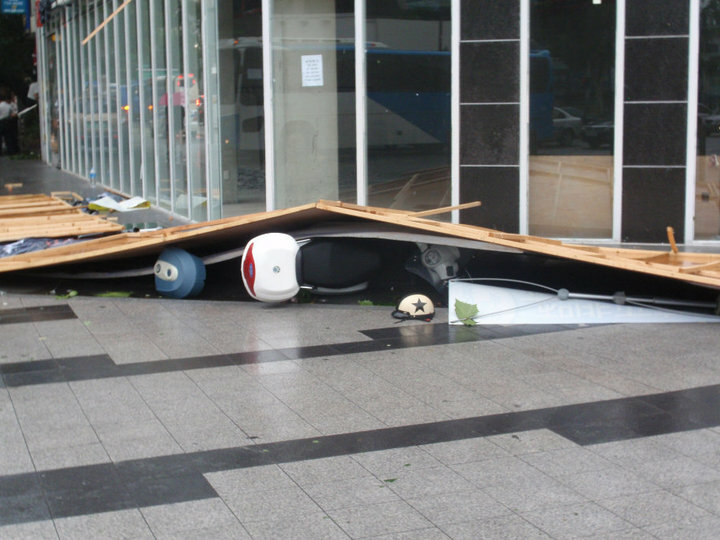 The damage was extreme in some areas and according to the Associated Press three people died in the storm. Even though Seoul was left in complete disarray, by the end of the day the storm's damage was almost unnoticeable because people cleaned up so quickly. Koreans truly know how to pick up the pieces and move on with life. I believe this spirit is similar to why they recouped so quickly after the Korean War which ended in 1953.